The topography of the seafloor near the coast plays a major role in determining how large tsunami waves become and what places get hit harder than others. Scientists had suspected that the same phenomenon might also take place in the deep ocean, where seamounts (underwater mountains), chasms and even islands could deflect tsunami waves in some places and amplify them in others. Researchers from NASA's Jet Propulsion Laboratory and Ohio State University used satellite altimeters, which can measure sea level changes in very fine detail, to observe "merging tsunamis" — a phenomenon where smaller waves merge to form one bigger wave. These waves can travel hundreds to thousands of miles without losing power. The measurements came from the Jason-1, Jason-2, and Envisat satellites which each flew over the tsunami at a different location. 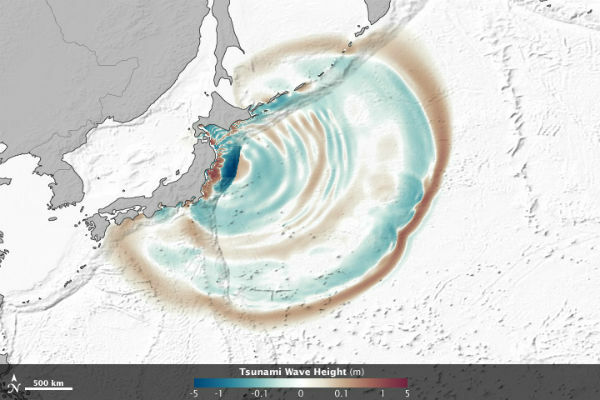 The measurements showed that the March 2011 tsunami doubled in intensity when passing over rugged ocean ridges and around islands in the middle of the Pacific. When the waves of the massive tsunami crossed the Pacific Ocean and reached the U.S. West Coast, they hit Crescent City, Calif., particularly hard because of two features of the seafloor off the coast: a piece of the ocean floor raised by tectonic activity that runs directly toward the city and the position and shape of the city's harbor. The team used a computer-based model to translate the measurements into images and animations, which shows how the waves can refract, bend and merge as they propagate. The peaks of waves are colored red-brown, while depressions in sea surface appear blue-green. Grayscale outlines show the location of mid-ocean ridges, peaks and islands. Researchers have suspected for decades that such ‘merging tsunamis’ might have been responsible for the 1960 Chilean tsunami that killed about 200 people in Japan and Hawaii, but nobody had definitively observed a merging tsunami until now.